Made from dried plant fibre and birch bark, stuffed with cotton wool. 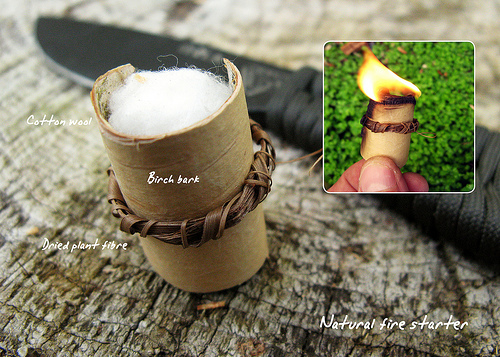 Once you ignite the cotton wool with a spark from a firesteel or similar, the birch bark will burn fairly slowly. That is a very nice idea. I use jelly soaked cotton balls but also always have some birch bark with me, so this would be a great way to combine the both. Thanks for the idea! Thanks Hendrik, jelly soaked cotton balls is always a good one to use.